Ensuring That Our Residential and Commercial Customers Are Always Comfortable. At Comfort Masters Company, we set the standard for HVAC repair and installation excellence. We are a family-owned and operated company that has been proudly serving Las Vegas and the surrounding areas since 2002. Our commitment to fast, friendly and professional service has earned us countless lifetime customers. We always have our customers’ best interests in mind, and we will never try to up-sell you anything during our services. We are a certified dealer for York, Rheem, Goodman, Trane, American Standard, Carrier and more, we only recommend what's best! Your time is important, so our service technicians strive to arrive promptly at a time that is convenient for you and your family; we will never make you wait hours and hours for a late technician! When you schedule a service call, we give you a specific appointment time and stick to it. We will also call, text or email you to let you know when your technician is on the way. Over 96% of our service calls are completed on the same day, and you can rest assured know that we will always be there at the agreed-upon time. When our technicians quote you a price, you can rest assured that there won’t be any hidden charges or last-minute add-on fees. We take pride in providing our customers with honest, upfront pricing. Our company charges by the job, not by the hour, so our technicians can give you an accurate quote before they even begin the job. During our price quote, we also give you alternate service options so you can make an informed choice as to what works best for your budget. Our call center is staffed seven days a week with experienced representatives, meaning you will never have to leave a message on an answering machine. When you call us, you will always talk to a real person who will solve your problems quickly and effectively. Whether you experience HVAC issues during the day or at night, we are prepared to serve you. Your Job Done Right the First Time, Guaranteed! All of our service technicians are highly trained and have the necessary skills to get your problem fixed - the first time! Upon completion of your job, you will receive a written 100% satisfaction guarantee. This guarantee states that if you are not happy with the quality of our work, we will do whatever it takes to correct the issue, no questions asked. 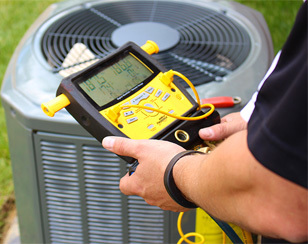 Trust an HVAC team that is completely comprised of fully certified and highly experienced technicians. When one of our crew members comes to your home, you can rest assured that they are qualified to install or repair your heating or air conditioning equipment. All of our technicians must meet rigorous pre-employment standards, which include a technical aptitude test, drug test, criminal background check, DMV check and reference verification. Technicians must also sign and abide by our customer service pledge. In addition, our company itself is fully licensed and insured for your safety and protection. Knowing that the company you are dealing with stands behind the quality of their work is important, which is why we provide written guarantees. Every heating and air conditioning system we install comes with a performance, 'lemon' and money-back guarantee, as well as our 100% satisfaction guarantee. Our guarantee promises that if you are not completely satisfied, we will do whatever it takes to make it right or you don’t pay a cent! All of our service repairs also come with a rock solid one-year parts and labor warranty - no hidden charges, no trip costs. Your service technician or installer will arrive prepared with a truck that is completely stocked with tools, equipment and materials to do the job. We promise you that no time will be wasted going to a supply house or back to the shop in order to get the proper parts and supplies. Schedule an appointment with us and see for yourself why so many Las Vegas residents and businesses trust us with all their HVAC needs!